As my practicum project is allowing me to explore the different communities and bloggers of special interest groups I wanted to highlight one blogger I find most interesting and insightful. Mark Bittman is a writer for the New York times and has his own food blog embedded into the news paper. He idea of the food industry has been evolving with the recent increase in a need for local sustainable establishments and practices. Each week Bittman disseminates a slew of informative, thought provoking and definitely intruging links to other articles, blogs or websites regarding similar food issues. 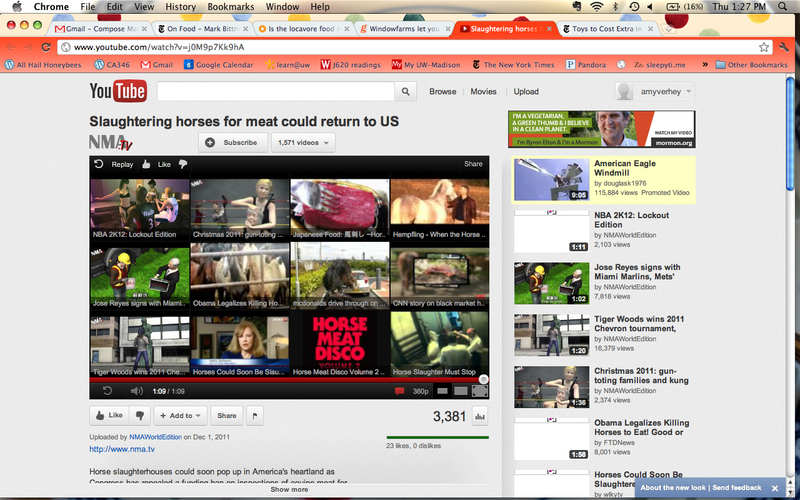 This week I have taken some screen shots of what I found most important to my practicum. 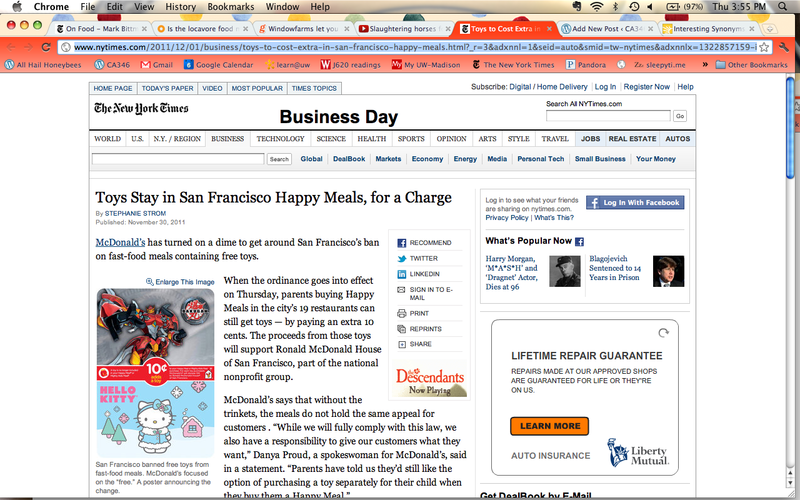 Bittman is using the the various links in order to connect people with real time news about food issues through the article from the Los Angeles Times about how San Francisco has put a price tag on McDonald’s toys so they can not be given away for free with kids meals. The issues that Bittman stresses to be most important are directly inline with Slow Food ideals as he informs his readers on how to reduce their carbon footprint and support the local movement. However, he does not do this in a biased manner. Like many other pieces written for the New York Times Bittman delievers information solely for the purpose to inform. 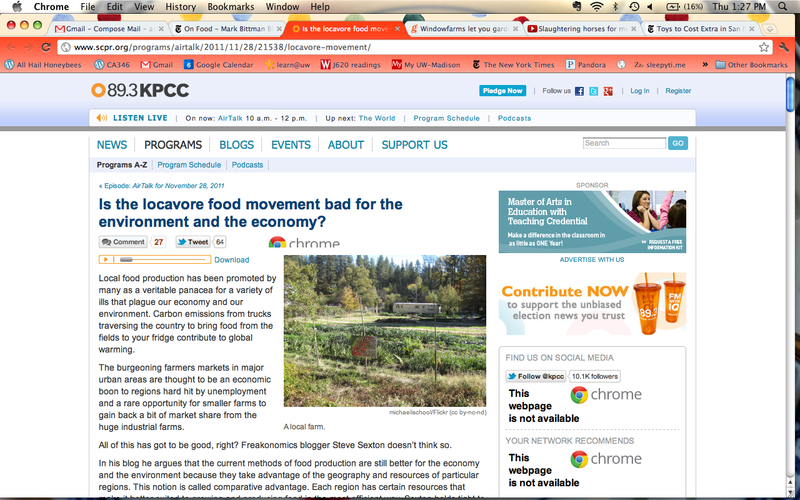 This is illustrated in his link to the article, ‘Is the locavore food movement bad for the environment and economy?’. Another helpful link that I found on this week’s list was for those who are passionate about supporting their local ideals and wanting to have a farm is with the typical hoop house. 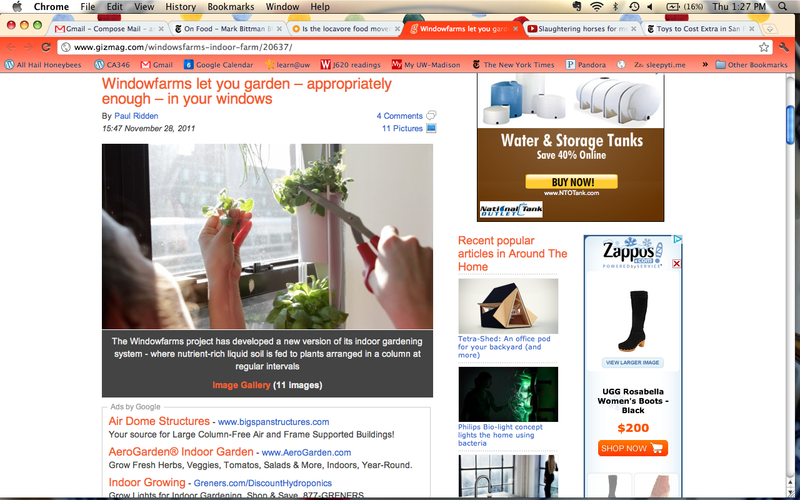 Hoop houses usually are quite an ordeal depending on the size of your garden, however Bittman offers an article explaining windowfarms. This could be especially helpful to those of us who live in cold climates for a majority of the year. This is allowing people to fully enthrall themselves with supporting the Slow Food movement. Finally the last link that I definitely thought I needed to share even though it may not be essential to the Slow Food argument is the introduction of horse meat! I was terrified and appalled that this could be a future menu item at a restaurant, the only comment I can make is I hope it is locally raised and they went in peace. I hope you all enjoyed this post and next week make sure to check out Bittman’s next post! Bon appetit.